Découvrez les points forts de l'ancienne et de la nouvelle Delhi, y compris plusieurs sites du patrimoine mondial de l'UNESCO, lors d'une visite privée d'une journée complète. Visitez Raj Ghat, le Fort Rouge, le tombeau de Humayun, Qutub Minar, Rashtrapati Bhawan, Porte de l'Inde, et plus encore. Les frais d'entrée, le guide privé et le véhicule, ainsi que la prise en charge et le retour à l'hôtel sont inclus. Visitez le Fort Rouge (Lal Qila), classé au patrimoine mondial de l'UNESCO, et l'immense Jama Masjid. Le matin, votre chauffeur et votre guide viennent vous chercher à votre hôtel et vous emmènent en ville dans un véhicule climatisé. Dirigez-vous vers la rivière Yamuna pour voir Raj Ghat, le mémorial du Mahatma Gandhi et l'endroit où il a été incinéré fin 1948. Regardez les jardins paysagers et le monument en marbre noir de Gandhi, puis continuez jusqu'au Fort Rouge. La magnifique forteresse de grès du 17ème siècle contient des palais et des jardins exquis à l'intérieur des murs épais. En face du Fort Rouge, admirez l'impressionnante Jama Masjid , la plus grande mosquée de l'Inde, construite en 1656 pour le cinquième empereur moghol de l'Inde, qui a également construit le Taj Mahal à Agra. 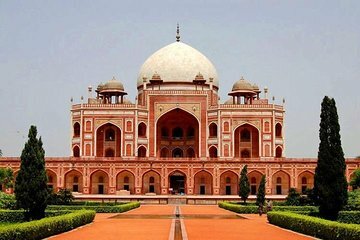 Faites une pause pour le déjeuner (à vos frais), puis dirigez-vous vers New Delhi pour visiter le tombeau de Humayun et Qutub Minar, et passez devant le Rashtrapati Bhawan (Maison du Président) et la Porte de l'Inde. Votre visite se termine avec dépôt à votre hôtel à Delhi. Raj was a great guide and he focused on the things that made Delhi unique. His restaurant selection was amazing and Delhi's architectural marvels were breathtaking. I only wish he was a little more enthusiastic about Humayun's tomb because we almost missed it, but it was definitely a favorite of ours once we saw it at the last minute. Our guide was informative and nice. Prepare to spend some time in traffic as distances in Delhi are considerable and rush hour is all day. Had an excellent guide, a very valuable part of the experience is how much perspective on India - history, religion, politics, daily life - you can get from your guide while in the car. The tour guide and the driver were brilliant. However, the restaurant they took us to red onion or the new red onion, has made us very ill ruining the next few days of our holiday, we have even had to re-organise another tour we were booked to go on as we have been too ill to go. The online reviews for this resturant are very poor but as the tour doesn't state the resturant you will go to you cannot read up on it before hand. If you do book this tour, avoid the red onion. This was a good tour. Pretty informative, wish we had time to see more. Guide spoke good English that for the most part was easy t understand. Guide was very good---for the main part anyhow, and the basic nuts and bolts of the tour were fine. I had requested no shopping---but---this was disregarded---and to shops etc we went---might as well have talked to myself. I had been under the impression that entry fees etc had been paid for in tour costs----didn't stop the guide demanding that I cough up for some of them---your paperwork regarding this needs to be more specific and tell all----Tips---I realise that people on the fringes of the tourist industry in India -- including guides and drivers are poorly paid ---but a traveller gets sick and tired of paying for a supposed entry fees etc etc ,-- but then ----everybody and his dog ---including guides and drivers---have their hands hanging out for tips---even the guide putting the heavies on you to tip various people---JUST TAKES THE ENJOYMENT RIGHT OUT OF IT AND SPOILS WHAT COULD/SHOULD HAVE BEEN A GOOD DAY----wake up to yourselves India---include--like many Asian countries---tips , gratuities etc in your prices---you can show these separately in price breakdown so that travellers know whats going on---but then---the boss would probably pocket them and the staff would be no better off---As it is --all smells like a big tourist rip off, and i am sure does nothing for India's reputation as a destination---but guess---who cares ?? Excellent tour with good guide and driver. Unfortunately my tour was on or close to Mahatma Gandhi's memorial day so some things were closed or too difficult to get close to. If I had know that I would have changed the date of the tour. Highlight of the tour was Humayuns Tomb and Jama Masjid. Nothing special,seemed a bit rushed. Our tour leader was very understanding and was able to accommodate to our needs. Enjoyed this trip! I thought the guide I had was excellent. He was very knowledgeable and I enjoyed hearing what he had to say. I also loved that he showed me the best spots to take photos from. I definitely recommend. Guide and drivers were on time, what a good way to discover Delhi without the hassle and the fear of being scammed at every corner. Too bad we could not access the Gandhi memorial because of a VIP visit but we saw some fantastic attractions like the Jama Masjid, Qutub minar and Humayun's tomb.